Seddique Mateen the Taliban supporting gay-hating dad of Omar Mateen was spotted yesterday behind Hillary Clinton at her event in Florida. Seddique made a sign for his favorite candidate Hillary Clinton. He likes her foreign policy. The campaign placed Seddique behind hillary in the stands during her talk yesterday in Florida. Local WPTV caught up with Seddique after the Hillary rally. Hillary Clinton spoke to a crowd in Kissimmee, just south of Orlando. She was supposed to be talking jobs, but started the speech off paying tribute to those affected by the Pulse Nightclub shooting. WPTV happened to notice the man, who has a mustache and was wearing a red hat, behind Clinton. 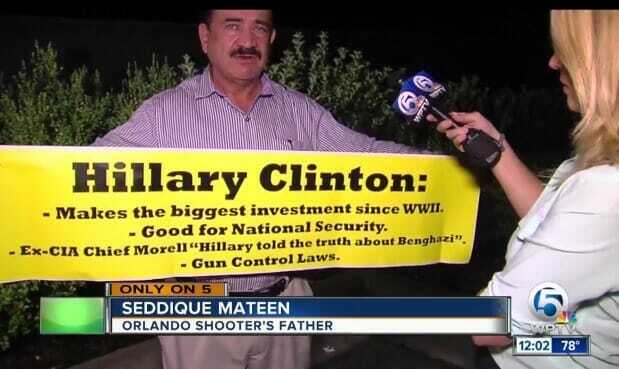 It was Seddique Mateen , the father of Orlando mass shooter Omar Mateen. NewsChannel 5 asked Mateen what he was thinking about when Clinton spoke about the Orlando incident. “We’ve been cooperating with the federal government, and that’s about it,” he said. “Thank you.” Mateen didn’t want to answer any other questions, but just hours later, we ran into him by chance at a rest stop on the way back to West Palm Beach. He wanted to do an interview and show us a sign he made for Clinton. “Hillary Clinton is good for United States versus Donald Trump, who has no solutions,” he said. So will the media hound Hillary about Seddique’s support for the next three weeks like they did Donald Trump when a white supremacist reportedly endorsed his campaign? Mike Cernovich posted this photo last night after Hillary’s Florida rally.